Description: A Metra train set moves from Union Station to the former Burlington coach yard. Description: A Michigan service train (on the left) and The City Of New Orleans (on the right) wait to board passengers at Chicago Union Station. Description: A Metra trainset emerges from under the shed at Union Station. Description: A Metra trainset moving from Union Station to the old Burlington coach yard. Description: A couple of GP38-2's switching the south end of Markham Yard as seen from The City of New Orleans while departing the Homewood station. Description: A southbound freight crosses old highway 3 at Gale. 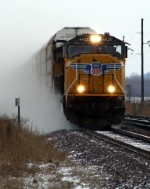 Description: A southbound freight crosses the Mississippi River as the snow falls. Description: Trains meet on the Thebes bridge. Description: A southbound freight as the snow falls. Description: A northbound freight as the snow falls. Description: The southbound City of New Orleans makes a passenger stop and changes conductors at Greenwood, Mississippi. Description: A southbound Canadian National freight passes the depot at Greenwood, Mississippi. Description: A former IC (nee GM&O) GP38 is parked for the night across the main from the depot in Greenwood, Mississippi. 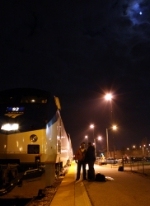 Description: A passenger waits for the northbound Amtrak City of New Orleans at the old Illinois Central station in Greenwood, Mississippi. 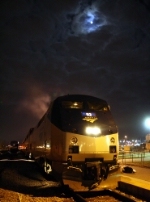 Description: THe northbound Amtrak City of New Orleans approaches its station stop at Greenwood, Mississippi, as passengers prepare to board the train. Description: The northbound Amtrak City of New Orleans approaches its station stop at Greenwood, Mississippi, as passengers and a new conductor prepare to board the train. Description: Amtrak's northbound City of New Orleans makes its station stop at Greenwood, Mississippi. Description: Amtrak's northbound City of New Orleans makes its station stop at Memphis, Tennessee. Description: Amtrak's northbound City of New Orleans makes its passenger and crew change stop at Carbondale, Illinois. Description: Engineer "On Time" Tommy Rathert boards his locomotive on Amtrak's City of New Orleans at Carbondale, Illinois. Description: A northbound Union Pacific freight with run-through Norfolk Southern power crosses the causeway over Rend Lake south of Ina, Illinois. Description: A northbound Union Pacific Z-train passes a pond near Zeigler, Illinois.